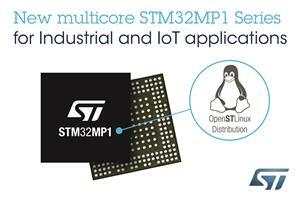 Geneva, February 20, 2019 - STMicroelectronics (NYSE: STM), a global semiconductor leader serving customers across the spectrum of electronics applications, is applying its Arm® Cortex® expertise to expand the capabilities of its industry-leading STM32 MCU portfolio to applications requiring even more performance, resources and large open-source software. The introduction of the STM32MP1 multicore microprocessor series with compute and graphics support combined with power-efficient real-time control and high feature integration will facilitate development of high-performance solutions for Industrial, Consumer, Smart Home, Health and Wellness applications. STM32MP1 series microprocessor (MPU) products leverage the strong, proven STM32*-family ecosystem from ST and its partners, including tools and technical support. Moreover, with the release of OpenSTLinux as a mainlined, open-source Linux distribution, it extends the STM32 family to address important customer requirements for real-time, power-constrained applications. With this combination of MPU and software, ST has assembled all the pieces to match the product supply requirements of many industrial and professional applications. Of course, the STM32MP1 is included in ST's rolling 10-years longevity commitment. "The STM32MP1 brings the strength of the STM32 experience to applications that need MPU compute and graphics support, combined with power efficient real-time control and high feature integration," said Ricardo De Sa Earp, General Manager of STMicroelectronics' Microcontroller Division. "Our commitment to consolidating open-source Linux software and microcontroller development support, combined with the longevity that consumer-oriented alternatives cannot equal, establish solid confidence in STM32MP1 for embedded MPU projects." With ST's new STM32MP1 microprocessor series (MPU), customers can now develop a new range of applications using the new STM32 heterogeneous architecture that combines Arm® Cortex®-A and Cortex®-M cores. This flexible architecture performs fast processing and real-time tasks on a single chip, always achieving the greatest power efficiency. For example, by stopping Cortex-A7 execution and running only from the more efficient Cortex-M4, power can typically be reduced to 25%. From this mode, going to Standby further cuts power by 2.5k times - while still supporting the resumption of Linux execution in 1 to 3 seconds, depending on the application. To accelerate development, ST is demonstrating its commitment to software development with the release of OpenSTLinux Distribution as a mainlined open-source Linux distribution. OpenSTLinux has already been reviewed and accepted by the Linux community: Linux Foundation, Yocto project® and Linaro. The distribution contains all the essential building blocks for running software on the application-processor cores. Enhanced STM32Cube tools, specially upgraded from the STM32Cube package for Cortex-M microcontrollers, features all necessary characteristics - and more -- to accelerate microprocessor development using Arm Cortex-A-core MPUs. ST's solution simplifies setting up MPU projects and configuring the on-chip resources. STM32MP1 part numbers are in production now, priced starting at $4.84 for orders of 10,000 pieces. Other pricing options are available. Products will be available through distributors in March. Please contact your local ST distributor or visit www.st.com/stm32mp1 for more details. This 3D graphics processor will enable equipment such as industrial control panels to enhance user experiences. Brian Edmond, President of Crank Software, which produces the Storyboard(TM) user-interface tool suite, commented, "The STM32MP1 platform strengthens ST's solution and aligns with Storyboard's industry-leading scalability. The powerful 3D GPU from Vivante® lets Storyboard users create the rich graphical experiences needed in today's embedded markets." In addition, ST has collaborated with Witekio for the Android porting to STM32MP1. "Witekio is proud to collaborate with STMicroelectronics for the Android porting on STM32MP1," said Yannick Chammings, Chairman of Witekio. "As a System Software integrator, Witekio accompanies ST customers in their IoT innovative project by developing STM32MP1 Series based full software systems from Linux or Android customization, to Qt HMI development and cloud connectivity." The OpenSTLinux Distribution supports development on the STM32MP1's Cortex-A7 cores and contains important elements that include Linux BSP, kernel, drivers, boot chain, and secure OS (OP-TEE: Trusted Execution Environment). To help customers accelerate development of secure Linux-based products with STM32MP1 MPUs, ST has worked with open-source software provider Timesys. "We are pleased to partner with STMicroelectronics for STM32MP1 Series MPUs to provide the tools customers need to accelerate development of more secure Linux-based products," said Atul Bansal, Timesys CEO. "The extensive STMicroelectronics investment in mainlining STM32MP1 series Yocto BSPs and integration of meta-timesys enables customers to reduce the amount of time spent managing vulnerabilities." ST's commitment to rich software support, which includes the STM32CubeMP1 firmware package, distinguishes the STM32MP1. STM32CubeMX facilitates software and hardware configuration of both the Cortex-A7 and Cortex-M4 cores. It handles C-code generation for the M4 core, DDR SDRAM interface configuration, and tuning tool. It can also generate Linux Device trees. ST further supports customers with a selection of community boards, and System on Module (SOM) boards from third parties.